Gobbler, originally uploaded by e.m.crawford. 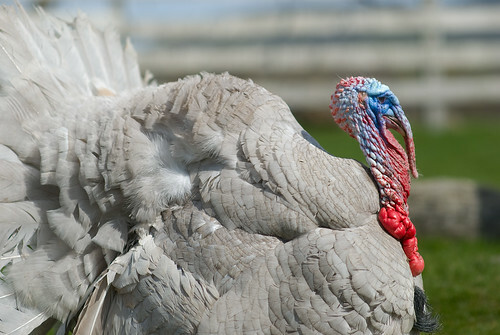 We’re hoping our Blue Slate Turkey, Duke, is as handsome as this fella. If Cranberry is, in fact, a hen we’ll be keeping her and Duke as a breeding pair. Sorry Tater, your going to be dinner. Wow what a beautiful bird! I didn't know they could look like that. They are still better eaten than admired but usually turkeys are so ugly that this makes you stop for a moment and admire. 🙂 Hope your mr. is as handsome.